Don't Let This One Get Away. Chrome Accessories with Color Matching Hard Tanneau Cover. One-Owner, Clean CARFAX. Remote Start, Rear Back-up Camera, Bluetooth Hands Free, 4X4, Color Match Hard Tonneau Cover, On-Star Navigation, EcoTec3 5.3L V8, 110-Volt AC Power Outlet, Bed Liner, Bumpers: chrome, Chrome Grille Surround, Dual-Zone Automatic Climate Control, Electric Rear-Window Defogger, Hard Tonneau Cover, LT Convenience Package, LT Plus Package, Manual Tilt/Telescoping Steering Column, OnStar w/4G LTE, Power Adjustable Pedals, Power Sliding Rear Window, Remote Vehicle Starter System, Theft Deterrent System (Unauthorized Entry), Thin Profile LED Fog Lamps, Ultrasonic Rear Park Assist, Universal Home Remote. 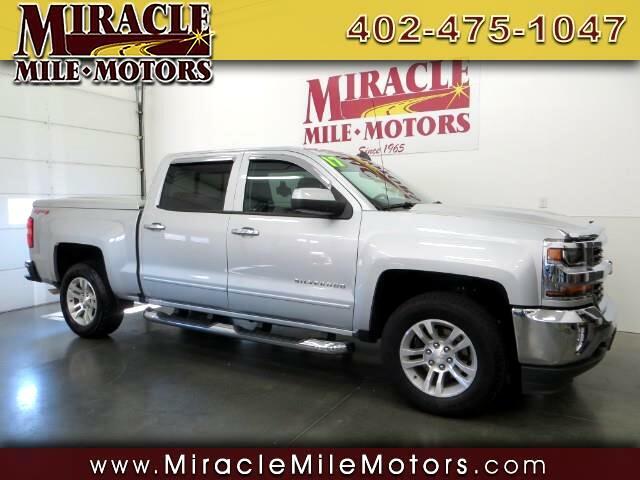 2017 Chevrolet Silverado 1500 LT 4D Crew Cab 6-Speed Automatic Electronic with Overdrive 4WD EcoTec3 5.3L V8 Miracle Mile Motors in Lincoln NE have been in business for over 50 years selling premium quality used cars, trucks and SUV's vehicles. We are committed to save you time and money and make your buying experience hassle free and pleasurable. All of our prices are clearly displayed on each vehicle. We offer bank financing , service contracts, and Carfax reports. NO DOCUMENTATION OR HIDDENS FEES. Word of mouth is our best advertising. Please look thru our inventory at www.miraclemilemotors.com or e-mail with any questions. 1-888-465-8963 87th & Hwy 2 Lincoln, NE 68526 Where Friends Tell their Friends to Buy CarS. Recent Arrival! Odometer is 6222 miles below market average! Some used vehicles may have minor road chips, light scratches, wheel scuffs, etc. Depending on the age of the vehicle, normal wear and tear should be anticipated. We may or may not have all the keys, owners manuals and floor mats. We will be happy to obtain extra ones for you at our dealer cost. Unless the vehicle has a remaining factory warranty, all sales are "AS-IS" with no warranty. Service Contract (extended warranties) are available for additional cost. Sales Tax, Title, License Fee, Registration Fee,, Finance Charges, Emission Testing Fees and Compliance Fees are additional to the advertised price.